"Online research" is supposed to be what lazy students do. Scholars, meanwhile, are expected to travel to different libraries, archives, and museums to consult documents, photographs, and books. This, however, is not necessarily true anymore because more and more resources are becoming available online. In some cases, surfing the web is not only less expensive, but also more productive because researchers can examine texts more closely and are not limited by policies regarding physical access to the materials. Plus, if your university library is closed, but you just need to check one small detail, online research is the most convenient alternative. The 5 websites enumerated below in alphabetical order are, in my opinion, the best free sources for Filipiniana online at this time. They each have their own strengths and weaknesses, and you'll have to search them all if you want to make sure that a particular title is really not available on any of them, but what's really good about these sites, is that unlike others that only reproduce the texts, you can see for yourself how the text originally appeared on the page, you can cite specific page numbers as if you had the book in front of you, and you can even download the entire book or certain pages (with one exception, which is indicated below). If you have any suggestions, please send a message or leave a comment via Facebook. Other sites you can check are: Biblioteca Virtual Miguel de Cervantes, Digital Public Library of America, Google Books, and Project Gutenberg. 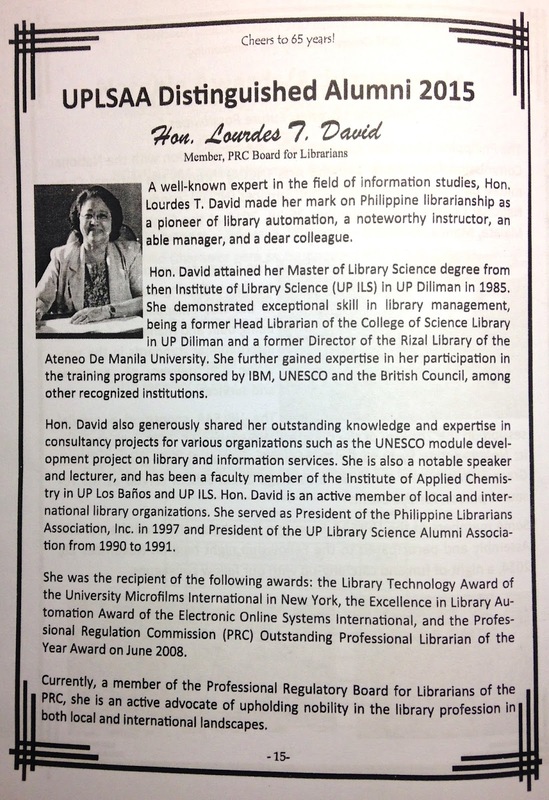 Congratulations to Mrs. Lourdes T. David for her Distinguished Alumna Award from the University of the Philippines Library Science Alumni Association (UPLSAA)! Anyway, below are the response she delivered, as well as photos of the plaque, the souvenir program, and the citation in the program. 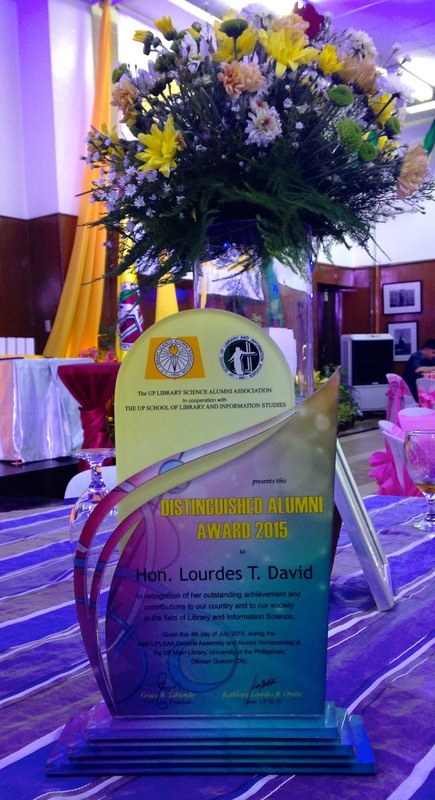 Thank you UPLSAA Executive Board 2014-2015 for this Distinguished Alumna Award. I humbly receive this award on behalf of all librarians and library staff that I have worked with from the time of Ms. Marina Dayrit, when I first worked in the UP Diliman Main Library, and the librarians of UP Los Banos, who inspired me to become a librarian. I also thank the faculty of the then Institute of Library Science, now School of Library and Information Studies, for imparting to me all the knowledge, skills, and attitudes of a good librarian. Allow me to also thank three people who played very important roles in molding me: Prof. Rosa M. Vallejo, Prof. Filomena Tann, and Prof. Namnama Hidalgo. Now let me tell you a story about how I became a librarian. My bachelor's degree is in Food Technology. When I graduated in 1965, I wanted to teach and study again, so I applied at the Department of Physical Sciences at UPLB, where I taught Chemistry and studied Food Science. While working on my thesis, I frequented the library to conduct my literature search. It was there that I observed and marvelled at how librarians were able to organize information, so that searching for the right information at the right time was possible. Little did I realize that this facination would lead me to the course Master of Library Science (MLS). I never finished Food Science because I married early and left UPLB for Diliman, where I worked in the main library as a research assistant. The fascination with library work turned into a vision that someday I will become a librarian. In 1985, the vision was realized and I graduated with my MLS. I never regretted the decision. The passion that I had then for Library Science is with me until now. I love librarianship and I am proud to be a librarian. Thank you Prof. Leonor Gregorio and the UPLB Library staff for showing me the importance of librarians in the conduct of research. I know that the image of librarians is not as high as that for faculty or other professionals, but we who are in the field know our importance. If mathematics is the queen of the sciences, library science is the mother of all disciplines. Without library science, now library and information science and other names akin to it, scientists, educators, students, and the whole of society will not be able to search for and access the right information at the right time, and will not be able to “stand on the shoulders of giants,” so to speak, when they conduct research because they will not be able to identify similar and related works done by others in their field. Today computers have made text searching of digitized or born-digital materials possible. However, books and other materials that are not available in digitized format still have to be catalogued for easy access. In addition, librarians today teach and/or assist users in searching for information. Our profession is a noble one and we have to increase our tribe so that more people will benefit from our knowledge and skill. In the last Librarians' Licensure Examination (LLE), the passing rate of new graduates was 70.36 per cent, while that of repeaters was only 21.47 per cent. Only 388 new graduates and 276 repeaters took the exam. The University of the Philippines had a 100 per cent passing rate, but only 25 graduates took the exam. These figures show the very small number of students enrolled in either the bachelor's degree or master's degree programs. We have to work together to increase enrollment and the passing rate. Our goal is an 85% passing rate. The challenge is for a group or groups to develop modules that would enable the repeaters to understand the concepts of the field. In the past, library science has been taught in a recipe-style manner. With AACR2, for example, the number of spaces between words and the punctuations were always emphasized. The display format was so important to make the catalog look good through uniform entries. Today the display is no longer that important. The content is the key to access and librarians have become teachers, facilitators, managers, and what have you. Let us help the repeaters cope with these changes so that they can pass the LLE, become better librarians, and help improve the image of the librarian. Click on the images to see the larger versions. This award is very prestigious because UPSLIS is the leader in library education and librarianship in this country. The bottom line in quality of education is the quality of teaching and teachers. The UPSLIS must be a training institution for librarians, as well as teachers of Library Science in this country. 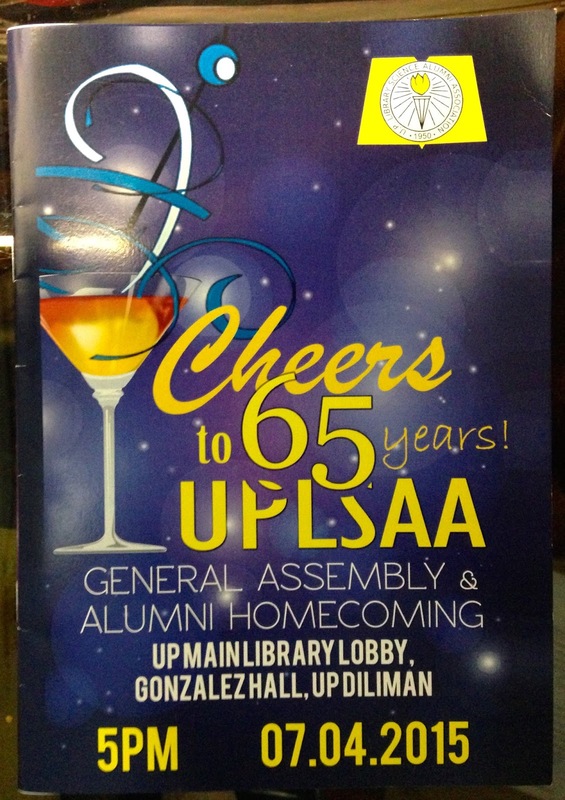 UPLSAA is its alumni arm. UPLSAA must also play this role by helping practitioners develop further through contintuing education programs designed not only for its graduates but also for graduates of other library schools. UPLSAA in this regard must also be a leader in providing life-long learning skills to Filipino librarians. Perhaps the quality that I possess that has inspired others and gained your vote to name me as the Distinguished Alumna Awardee for 2015 is my belief in people. I believe that all persons are capable of improving themselves through mentoring, and exposure to life-long learning programs. Such activities enable them to see themselves as capable of sharing ideas to colleagues, networking, and becoming more and more competent. Learning is from cradle to the grave. All of us have this ability to believe in man’s capacity to learn and help in the education of our society. Let us stop remembering how some people look at our profession. That is past. We are what we are at the moment, and let us see ourselves as important members of society. As librarians we have travelled far and wide to either attend or deliver papers in conferences to share our ideas. We have helped students graduate. We have helped faculty with their research and more. Let us therefore share these abilities with other people and encourage them to become librarians. This response will not be complete without expressing my gratitude to God Almighty. He has always been my Great Wall, on whom I lean for strength, guidance, compassion, and love. The teaching to love one another is His greatest gift to humanity. Thank you UPLSAA for this opportunity to share my thoughts about librarianship. Reproduced with the author's permission.